UDM Downloads > The Palette program is a tool for the creation of 'theoretically correct' melodies.! The Palette program is a tool for the creation of 'theoretically correct' melodies. The program is based on composition theory and the theory of harmony. The strong theoretical base makes the melody composing process easier. The program contains seventeen lessons. Each lesson has one or two demo-scripts. The lessons sequentially describe all process of melody creation. The program represents the melody in a structure that is analogue to the structure of common speech. There are words (motives), phrases, sentences, commas (caesuras), question marks and points (cadences). Such an approach allows a simple and effective algorithm to be applied to the composition of melodies. The program implements twenty four methods of motive development. Some of them are listed here: variation; inversion; repetition; new rhythm; sequence and so on. These methods similar to the visual effects in graphical editors. 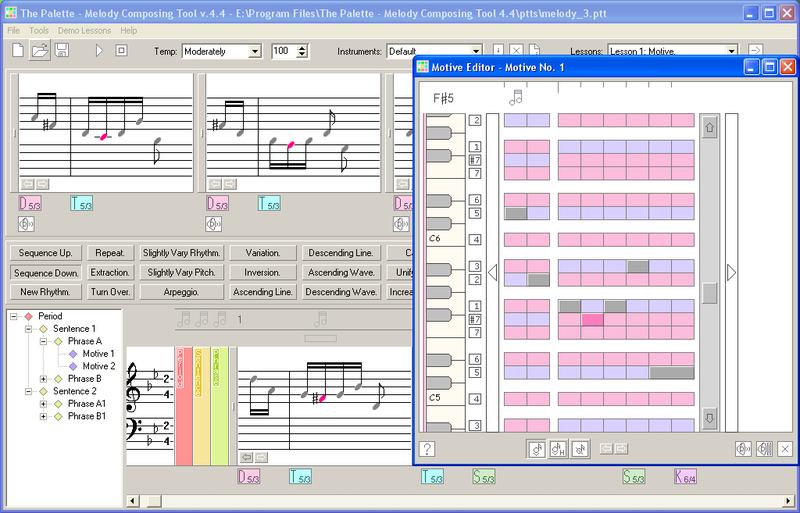 The program suggests the 'theoretically correct' algorithm for the melody creation. The main advantage of the algorithm is: we take some existing part of a melody (motive or phrase) and apply the methods of motive development (for example, variation) to this motive of phrase to create a new motive or phrase of the melody. The program knows the most commonly used triads and sevenths of the key. The program represents the chords in a four-voice form. The names of the voices are soprano, alto, tenor and bass. Any chord has many variants of an arrangement. For example: any chord note can be placed in the first position of the arrangement. The chord notes can be arranged adjacently (tight arrangement) or remotely (wide arrangement). The user can choose both the type of the chord and the arrangement of the chord. The program has an option that exports the melody to a midi (*.mid) file. The exported file consists of three tracks: melody, chords, bass. You can import this file to any midi sequencer or style arranger to create a complete tune.